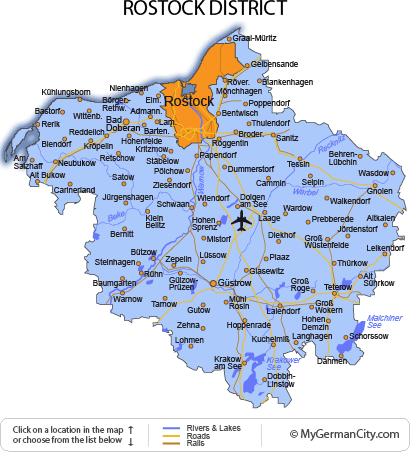 The coastal region of the Rostock District stretches along 62km (39mi) of the Baltic Sea in North Germany. On the edge of the Mecklenburg-Western Pomerania state, it surrounds the university city of Rostock and has many seaside resorts and spas to its name. To the south it touches the northern edge of the Müritz Lakeland. There it is filled with many lakes and waterways, including the large Inselsee to the south of the district capital, Güstrow, and the river Warnow running through from south-west to the north. The whole area is very popular with the national population as a tourist destination, but the state as a whole is sparsely populated. The town of Bad Doberan is one of the most popular bathing resorts in the area. It also used to be the summer ducal residence because of its great location, climate and vistas. Neighboring Heiligendamm is one of the oldest seaside resorts in the country, and was the location of a G8 Summit in 2007. And the delightful Kühlungsborn along the coast has a very long beachfront and wide promenade following almost its entire length. Many of the coastal resorts in the Rostock District are linked by the narrow gauge steam railway known as the Molli, except for the beautiful town of Graal-Müritz which is the only resort on the “other side” of Rostock. It is locally famous for its extensive rhodedendron gardens and certainly worth a visit. Heading to the south of the Rostock District, the ancient figure of Henry the Lion is celebrated here — the most powerful prince of his time. His grandson founded the town of Güstrow over 800 years ago. This is the location of a delightful 16th century Schloss sitting on a huge lake and with extensive landscaped gardens. It also has one of the best examples of a brick-gothic cathedral with their 13th century structure. The forested nature park Nossentiner-Schwinzer-Heide sits to the south of the Rostock District and is a perfect location for outdoor activities. Although relatively flat, the scenery offered by the natural wetlands brings along all kinds of wildlife to the area — including ospreys.